A Circassian Prince or Nobleman completely armed. Home » A Circassian Prince or Nobleman completely armed. Un Prince, ou Noble Tscherkesse, complétement armé. 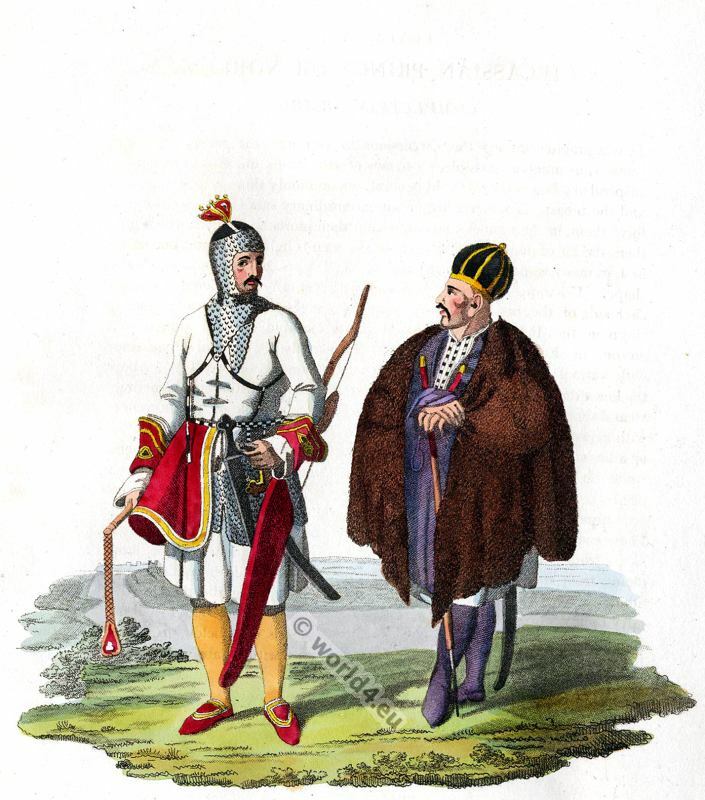 IT is a practice among the Circassians to compress the waist, from early infancy, as much as possible, by means of the straps on which the sabre is suspended; hence they are, in general, uncommonly thin between the loins and the breast. Their feet are of an extraordinary small size, because they force them, in the tightest manner, within their morocco slippers, which gives them the air of dancers. The dress of the men is light, neat, and becoming; and, in many respects, resembles that of the Tartars, but is of a more elegant shape. The upper garment is furnished with a small embroidered pocket on each side of the breast, for containing cartridges. On the head, which is shorn in the Polish fashion, they wear an embroidered cap quilted with cotton, in the form of a melon, but occasionally lower, and ornamented with various gold and silver laces, especially among the wealthy. Above the lower dress, which is made of light stuff, persons of distinction sometimes wear a short rich waistcoat, as it were to supply the place of armour, either with or without a great-coat. The upper dress, consisting either of cloth or other strong woven stuff, is somewhat shorter than the under garment, while the sleeves are slit open, and frequently bordered with furs. When a prince or noble pays a visit of ceremony, he arrays himself with all his accoutrements arid coat of mail, as is represented in the opposite engraving. These coats of mail arc manufactured of polished steel rings, and imported partly from Persia, and partly from Kubescha. The helmet and the arm-plates, from the former of which a net of rings hangs down as far as the shoulders, are manufactured of polished steel. In the girdle they usually carry their dagger and pistols, while the bow and quiver are tied by straps round the hips. In common visits, the coat of mail is worn below the upper dress, and on this occasion they arm themselves only with a sabre, and cover the head with an ordinary cap. This entry was posted in 1803, 19th Century, Asia, Kyrgyzstan, Military, Russia and tagged Edward Harding, Russian national costumes, Traditional Kyrgyz costumes on 10/31/14 by world4.